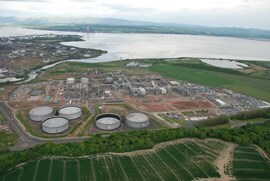 On 31st October, INEOS acquired the Forties Pipeline System. Last week during a routine inspection INEOS contractors discovered a small hairline crack in the pipe at Red Moss near Netherley, just south of Aberdeen. A repair and oil spill response team was mobilised on Wednesday, December 6, after a very small amount of oil seepage was reported. Measures to contain the seepage were put in place, no oil has been detected entering the environment and the pipe has been continuously monitored. A 300 metre cordon was set-up and a small number of local residents were placed in temporary accommodation as precautionary measure. The pipeline pressure was reduced while a full assessment of the situation was made. Despite reducing the pressure the crack has extended, and as a consequence the Incident Management Team has now decided that a controlled shutdown of the pipeline is the safest way to proceed. This will allow for a suitable repair method to be worked up based on the latest inspection data, while reducing the risk of injury to staff and the environment. As always, safety remains our top priority and local residents, FPS users and other stakeholders are all being kept fully informed of the situation as it develops.